Brisbane-based Talbot will be joined by current Supercheap Auto Bathurst 1000 Champion, David Reynolds; Le Mans 24 Hour LMP2 pole-sitter, John Martin and highly experienced car owner, Mark Griffiths, forming one of the strongest combinations in the Pro-AM field. He will also bring support from his 2017 Australian GT Championship sponsor, Australian fuel company, MEGA Limited and WashIt Australia Mobile Truck Wash. It will be the first time that he has driven one of the Mercedes-AMG GT3 machines in competition, having won the Blancpain Endurance Series in 2016 aboard a Ferrari and last year’s Bathurst success and Australian GT campaign in a Walkinshaw Racing-prepared Porsche 911 GT3 R.
The last minute opportunity to join the Hogs Breath Cafe-backed Griffiths outfit with Reynolds and Martin was ‘too good’ to pass up according to Talbot. He has raced extensively with Martin in the Australian Endurance Championship in 2017 and the pair drove to fourth outright in last year’s 12 Hour with Duvashen Padayachee to wrap up the Pro-AM Title. While Talbot has not raced with Reynolds before, the Albury-raised Erebus Motorsport driver is one of the leading Virgin Australia Supercars Series drivers to join the Liqui-Moly Bathurst 12 Hour this year. Talbot holds a great relationship with Griffiths – the pair racing against each other in Australian GT Championship competition. 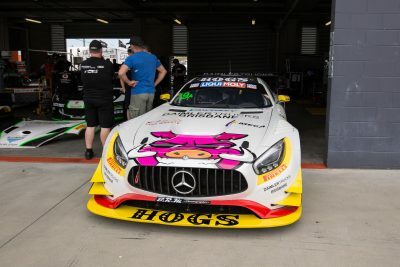 The quadrant held an encouraging test session at Queensland Raceway last week to ensure all drivers were acquainted with the potent Mercedes-AMG package. The three-pointed star won the Bathurst 12 Hour in 2013 at the hands of German legend, Bernd Schneider, Thomas Jager and Alexander Roloff and have been in contention each year since, however have not been able to repeat that success. Practice for the Liqui-Moly Bathurst 12 Hour gets underway on Friday at 8:25am with qualifying and the top 10 Shootout Saturday and the once around the clock classic starting in the dark at 5:45am on Sunday. In Australia, the Top 10 Shootout and race will be shown live and free on 7mate or streamed on the 7PLUS App. Internationally, the Shootout and Race will be streamed on the Bathurst 12 Hour website – www.bathurst12hour.com.au. “I can’t wait for the weekend to roll around, I think we have a great driver line-up and we’re all motivated to put in a really strong performance at Bathurst, where hopefully we can go two from two in the Pro-AM category. “We had been exploring options for the 12 Hour and thought they’d almost been exhausted then Griffo came to me with the opportunity, he had Dave and John on board – with that lure it was too good to pass up. “Our test session saw all of us pretty close in times and matching with similar cars in the Pro category, so it all bodes well. Nevertheless, the Mountain is the Mountain and if it can think of a challenge to throw at you – it will! “I’m excited to be joining with Mark and his team for the first time. We’ve got on real well over the last 12 months at the Australian GT events and he always turns out a great racecar. Dave with his experience as the current Bathurst 1000 Champion and what he has achieved there throughout his career will help our cause significantly. “It is also awesome to be joining up with John again. We’ve known each other for most of our lives through our family businesses, we won together at Bathurst last year and had plenty of success in the Australian GT Endurance Championship last year. “It is cool to finally be racing a Mercedes-AMG GT3 – there’s a lot of car with the big front bonnet and that thundering V8 underneath. It is terrific to drive and I think it is going to be amazing once we hit the track. “It is really like driving an incredibly fast, big, comfortable lounge chair! “We’re ready for the battle up there, it is going to be a big day all around, but we have the experience around us and are keen to get into it. “It is awesome that we can continue the relationship with MEGA at this prestigious event – which will be their first Bathurst 12 Hour, alongside a long term partner in WashIt Australia Mobile Truck Wash. They will join Mark’s major sponsors in Hog’s Breath Cafe and Daimler Trucks on the car.